A raging hurricane — Florence — menaces the East Coast. Landfall is expected Thursday… by which time it may attain the fury of a Category 4 tempest. 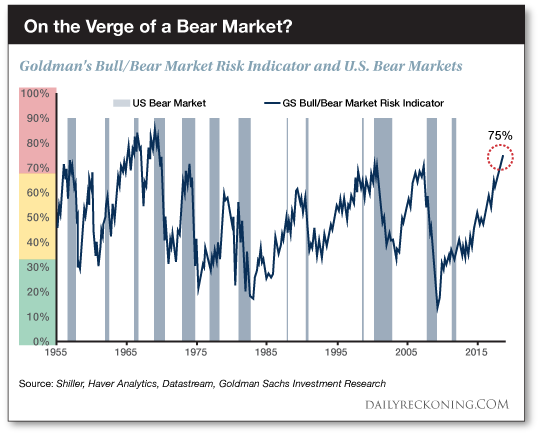 One prominent market indicator is presently blaring its loudest warning in 50 years. Answer anon. First we take a reading of markets today… while the weather holds. Stocks were up and away today. The Dow Jones ended the day 114 points in green territory. The S&P closed 11 points higher… the Nasdaq, a hearty 48. Stock valuations, growth momentum, unemployment, inflation and the yield curve (the spread between short-term and long-term interest rates). No single metric throws off sufficient light to read by. All of these variables are related. Tight labor markets are typically associated with higher inflation expectations. These, in turn, tend to tighten policy and weaken expectations of future growth. High valuations, at the same time, leave equities vulnerable to de-rating if growth expectations deteriorate or the discount rate rises, or, worse still, both of these occur together. This indicator has mirrored closely the S&P’s forward performance since 1955. The higher the reading, the greater the risk. It gives 75% odds of an impending bear market. Not since 1969 has it recorded such heightened levels — and such heightened risk. That is, not a crash, but a dismal slump — not a squalling rain, but an endless drizzle. We anticipate a “melt-up”… followed by a meltdown perhaps next year or the year following. But the Goldman men incline toward the drizzly forecast. Stock market valuations hover at or near record highs, they grant. But inflation is just now finding its legs. And they believe “structural factors” such as globalization’s disinflationary bias may keep it caged. A lower inflation means the Federal Reserve will not be forced to raise interest rates nearly so hastily. That, in turn, means the market is less vulnerable to a rate shock. You may prefer a slow motion bear market to the “cathartic” sort that comes by way of a single knockout blow. Once done, the business of recovery can proceed immediately — as a village can build anew after the hurricane knocks it flat. The “long period of relatively low returns” is rather a long gray twilight, a death by inches, an extended and demoralizing siege. 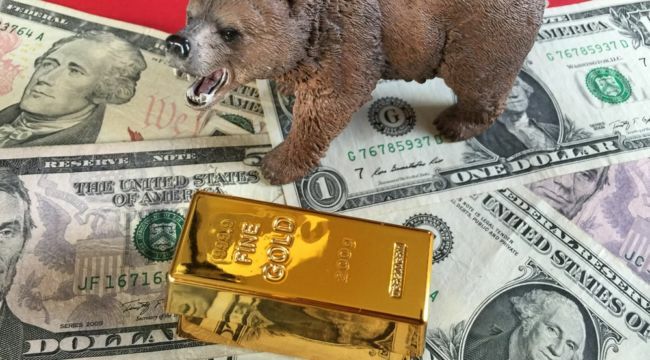 Goldman projects this protracted bear market could last five years… until 2023. The U.S. has already expanded fiscal policy and its debt levels and budget deficit are rising, which could make it difficult to find room for significant easing. There may be room for U.S. interest rates to be cut in the next downturn but less so than in other downturns. These Goldman fellows sound lots like Jim Rickards. Jim’s been high on his rooftop for years, hollering the same warnings to anyone with ears to listen. Debt at all levels has swollen to dimensions truly obscene, Jim insists. If they had raised rates, many would have grumbled, the stock market would have hit a speed bump, but it wouldn’t have been the end of the world. Instead, “Helicopter” Ben Bernanke found the courage to act… by opening the monetary floodgates. That is, he found the courage to cave before the entire financial and political establishment. That is, he found the courage to boot the soda can down the road… and inflate a gargantuan bubble so doing. Perhaps if our courageous banker had instead found true courage — the courage to raise.